After watching the Disney movie Brave a few dozen times with their princess obsessed sister, the boys asked for archery lessons. Well, technically they asked for "bow and arrow classes" so I assumed they meant archery. I turned to my bff google and typed in 'archery lessons Des Moines.' Up popped Archery Field and Sports. I browsed their website and off we went one Sunday afternoon. Harrison and Elizabeth (ages 5 and 3) decided against trying it out, but Max, my husband, and myself had a blast! Archery Field and Sports is a family owned business in Altoona, making it a very family friendly environment. I was pleasantly surprised at how great they were with the kids. 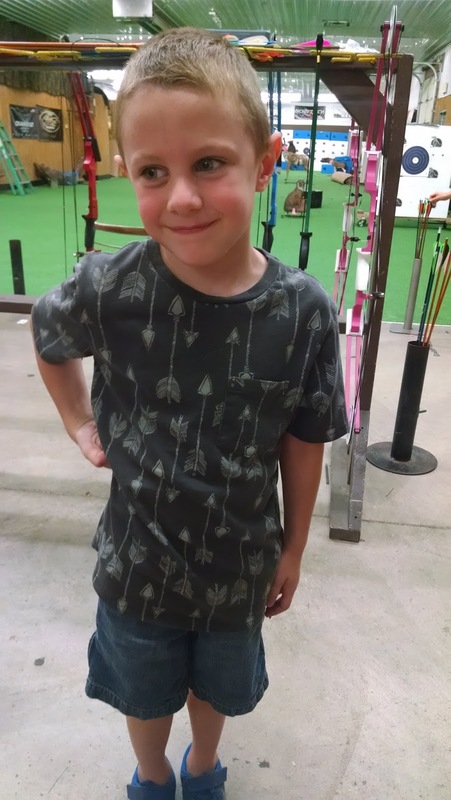 Our instructor was amazing and never left Max's side while he shot his arrows. He even tried to reassure Harrison and Elizabeth in case they wanted to give it a try (they didn't). 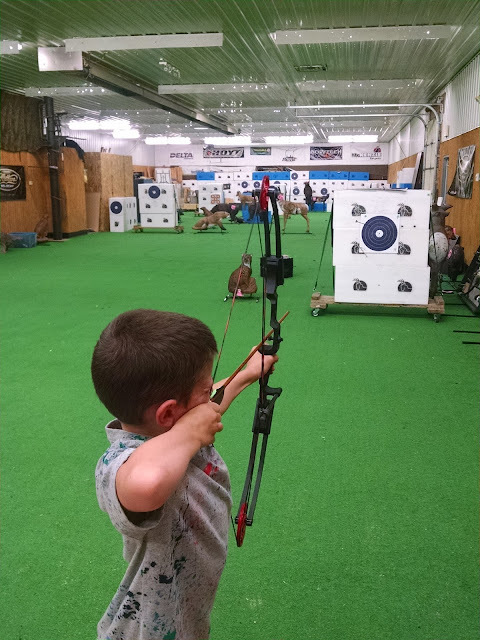 The instructor was sure to go over the safety rules with Max, how to safely and properly load the arrows, and to yell out "clear!" when it was okay for everyone to retrieve arrows. My two favorite aspects of Archery Field and Sports: 1.) 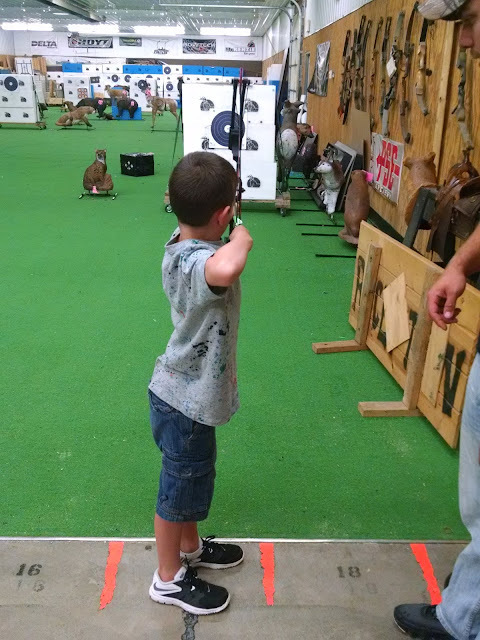 It's an indoor range, which made it perfect for the 90 degree day and will be a great winter time activity. 2.) 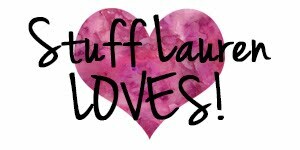 They have all of the equipment there (you do pay a rental fee), so we didn't have to worry about bringing anything. 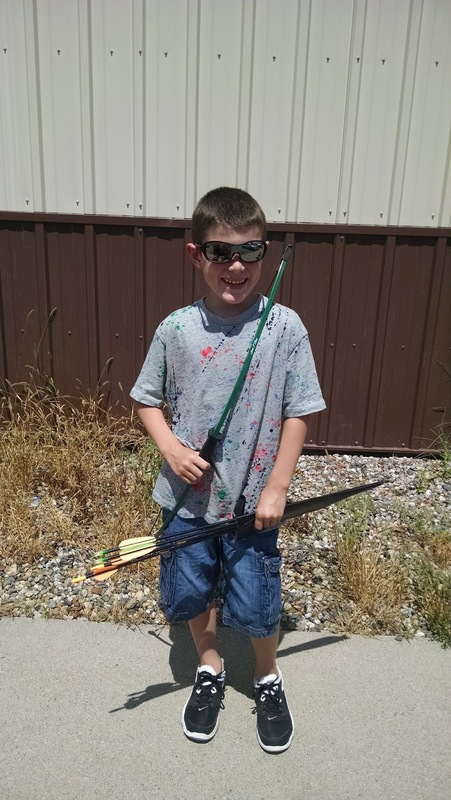 Max loved it so much that we wound up purchasing a bow and arrow set for him, so we'll be bringing that next time we come. For kids older than 10, there's also paintball in an impressive outdoor field. My husband and I instantly thought their paintball field would be a great parents day out activity! We will definitely be making return trips here, as Max is now obsessed with archery.